Thanksgiving dinner was a success! Matt and I had a wonderful meal and I thoroughly enjoyed putting my own twist on a few classic recipes. We did, however, miss our families and look forward to spending time with them on Christmas. Our Thanksgiving menu included: homemade cranberry sauce, semi-homemade cornbread stuffing, chive and cream cheese mashed potatoes, homemade yeast rolls, and of course turkey and from scratch gravy. I also made a few desserts! You can check out my quick and delicious apple pie recipe and be on the lookout for Matt’s favorite dessert, cream cheese pumpkin roll. We had a lot to be thankful for this year and I am so glad I was able to prepare such a flavorful meal for my well deserving husband. The turkey was fantastic! I stuffed the cavity with oranges, lemons, sage, thyme and fresh sprigs or rosemary. I made a compound butter with sage, thyme, rosemary, and fresh cracked black pepper that I spread on the skin of the turkey. 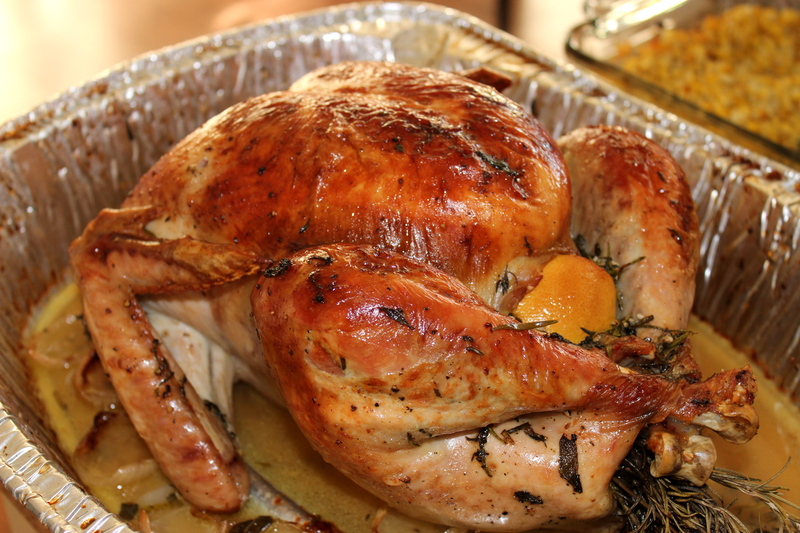 I basted the turkey regularly with pan drippings and some melted butter infused with the same herbs I listed above. It was so good! I’m glad we have a lot of leftovers! One of Matt’s favorites sandwiches is the Turkey Cranberry sandwich from Paradise Cafe and Bakery. I decided to draw inspiration from that when looking for a way to repurpose our leftovers. I used my homemade cranberry sauce (Never made it? It’s so easy! Throw a bag of cranberries into a small stock pot with 1 cup sugar, 1 cup water, a splash of orange juice and apple cider, as well as a generous pinch of cinnamon and orange rind and let it simmer on the stove until the cranberries break down and the sugar thickens the sauce. It only takes about 20 minutes and is a thousand times more delicious than the canned variety!) and avocado on this sandwich and it really made the sandwich fantastic. I also added a generous sprinkle of my semi-homemade cornbread stuffing (I’ll fill you in on this recipe later!). 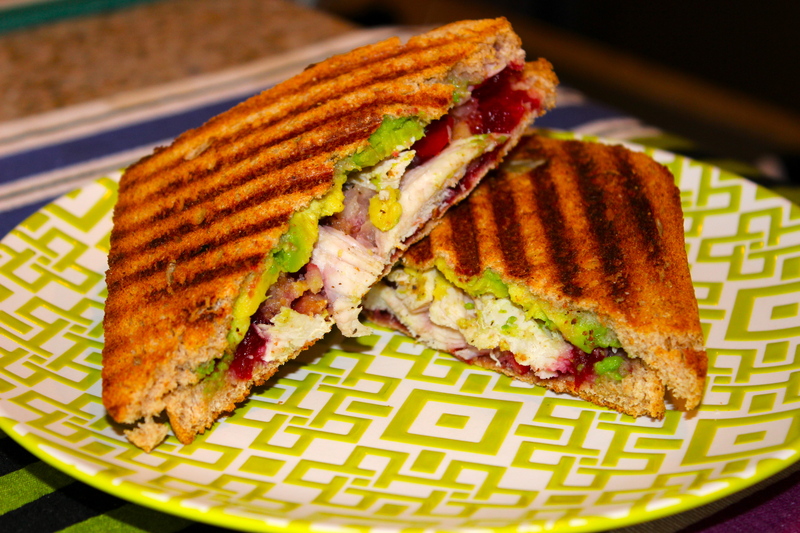 Avocado…trust me, it’s fantastic with the cranberry sauce! Cut them in half and enjoy a not so boring twist on leftovers!